A flexible, lifelike and intriguing wooden crocodile. This master piece of the creativity of our craftsman will leave no child or adult unmoved. 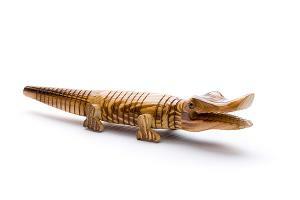 This wooden crocodile is made in such a way that when your child plays with it, it moves like a real crocodile. Flexible, intriguing and lifelike! A real example of the art of woodcraft. This wooden toy is hand made and produced out of sustainable natural wood. This wooden crocodile is not only fun to play with but also stimulates the development of the gross and fine motor skills of your child and above all, its fantasy world. The crocodile suits also perfectly as decoration for your child's room or your living room or your desk. Each wooden crocodile is individually branded by the natural grains of the wood and the touch of the craftsman.